Mcghee’s Marquees caters for all events, whether they’re corporate or personal, or if they’re aiming to accommodate a large number of guests or simply a family. We aim to supply you with everything you need to give your garden party guests a day to remember. Our practical seating options enable you to choose between luxurious banqueting seats or more practical folding chairs to best suit the environment you wish to create. Scalability is also pivotal to us at Mcghee’s Marquees, and we offer an excellent range of shelters of various sizes to cater to just about any number of guests that you’re expecting. We also provide solutions for lighting and heating so that your party doesn’t need to end when sunset arrives. Mcghee’s Marquees aims to provide a flexible and comprehensive service no matter what type of event you have in mind, so feel free to call us today on 0141 641 1062 or visit our website’s Contact Us page to make an enquiry. 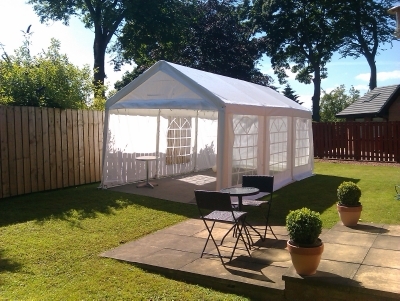 garden party marquee hire for all your events.